Here Silica sand, which is prepared in a separate mixer using sand, and Sodium Silicate is added 5 to 6 % of sand quantity of 100 kg, with a Dry core break down agent added in it. While sand and break down agent are mixed first then Sodium Silicate is added to ensure proper mixing. Then CO2 gas is passed through the holes made in pattern or cores. 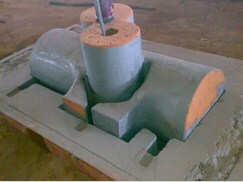 And gas is passed at a uniform pressure, to harden the sand mould. And then core is stripped out of the pattern by ramming smoothly. This is done on moulding machines using sand prepared in intensive sand mixers with coal dust, Dextrine (if required), Bentonite and water. In this type of Moulding, Facing sand is used for covering the Pattern and then backing sand is used for moulding in regular way. After proper inspection of the Pattern and the match plate, it is mounted on the moulding machine to set the tightness level and mould boxes are lifted from the match plate after making the moulds. Once this is made ready, moulding box is placed on the machine into match plate fix going inside the Lug Holes with buses. After covering the Pattern with facing towards the backing sand is added and joint of the machine is started. Once the sand sets in the moulding box, squeeze board placed above the box and is squeezed into simultaneous jolting for a minute or so. Then the squeeze board is taken. 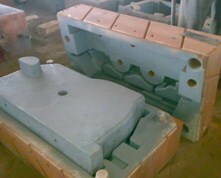 The mould is checked for proper condition and placed on them for pouring. The Cope and drag boxes are made separately with cope box having down spare and air vents. During the process of moulding, the sand prepared is also checked in the laboratory for moisture, Permeability, Green Compression strength, Computability etc. So that quality of the sand is maintained. Part ‘A’: – 2% of the sand quantity. First part ‘A’ and Part ‘C’ are mixed along with sand in the sand mixer for about 90 second to 2 minutes and then Part ‘B’ is added and further mixed for one minute. Immediately after this, sand a discharged from the mixer and put in the core box. The sand mix is rammed by way of hand rammers and leveled on the core box. After allowing the sand to harden slightly, the core is stripped from the Pattern and allowed for ageing further. In this systems Resin and activator are made in a single from and after mixing it with sand for an initial period of about 2 minutes, Hardner is added and mixed for another one minute. Then the sand mix is put in the core after allowing the sand to harden slightly, the core is stripped from the Pattern and allowed for ageing further. An air settling chemical is mixed with sand for a minute to 90 seconds and then moulds are made as a for with further procedure. Here the painting is done essentially in water base graphite paint prepared in the same as mentioned in A1 but left over for a longer time for drying. The mould are spray- painted with graphite based paint which is prepared by mixing ready mix graphite paste / powder in water to the required viscosity so that paints is neither thin nor thick but at the same time the moulds could be painted uniformly. Once the moulds are painted, they are left over for drying to about 6 to 8 hours (sometimes over night). Here the paint is prepared by mixing ready mix by paste / paint with thinner (spirit) to the desired viscosity and then spray painted uniformly in the mould which is ignite after painting so that moulds get dried properly. Here the painting of the moulds can either water base or thinner base and paint – either water base or thinner base is prepared in the same way as mentioned above in A1 / B1 depending on the type of painting. 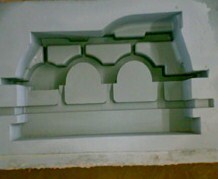 The moulds are left for over or ignited for drying. Cores are also painted according to the type, in either be water base or thinner base, paint prepared by mixing graphite ready mix paste or powder in water or thinner as the case may be and then spray paints. Generally water base graphite paints are as spray-painted and the torched or heated in the oven at a temperate of 105 degree celsius for proper drying. Here the cores are essentially painted with in inner base painted prepare as mentioned in b1 and then ignited for proper drying. Here the painting can be water base or spirit base graphite prepared as mentioned in A1 or B1 and then as spay painted – torched or ignited as the case may be. These are generally painted in water base Zircon mix paints, prepared in the same way as graphite paints but is important that these cores are dried completely after painting. However in the all above cases, the moulds and cores are ensured for proper drying, if necessary torching before after core setting. Here the sand is mixed with Core Oil & Dextrin according to the type of cores which the baked in core oven with a maximum temperature of 250 degree celsius to 280 degree celsius. The percentage of Core Oil & Dextrine also varies from 1% to 2%. Hare the sand and Dextrine are mixed first and then Core Oil is mixed with if mean while, core boxes cleaned thoroughly and checked before farthing up the sand mix for core making. Using fingers if necessary for intricate portions and the entire core is rammed properly and then leveled. It is now placed on a core plate upside down and the core box stripped from the core, which is then sent for baking & painting. These cores are made through shell core shooters using resin-coated sand. 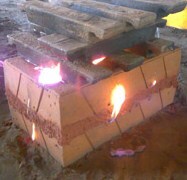 Here the core box, which is known as “Die” is, heated from 200 degree celsius to 400 degree celsius. Then the time is taken for baking the core. After the core is baked at the time decided, the core is ejected from the die and the shell core is prepared. Then the resin-coated sand is introduced into the die by air pressure. The sand inside the die takes the shape of the core cavities and gets heated up. Then onwards the time is taken for baking the core, after the core is baked at the time decided, the core as ejected from the die. And the shell core is prepared.